In this article, we discover how Mind Maps can help you when you are problem solving, whether in the office, at home or in the classroom. Problem solving is a key skill which can help you succeed. Problems or obstacles occur all the time, and it is important that you can provide quick and imaginative solutions to them. Being able to problem solve is one of the major attributes looked for by universities and employers, as it displays both logical and creative thinking. What do Mind Maps have to do with it? Using Mind Maps can help to bypass the usual panic instinct of the brain when confronted with a problem to solve. When faced with a problem, we automatically panic, with symptoms of ‘intense fear, a racing heart, breathlessness and trembling’, according to the New Scientist. Not ideal for getting into a problem solving frame of mind! Instead of ‘forcing’ your mind to come up with a solution, which can result in stress, Mind Mapping opens up possibilities and calms you. When you Mind Map for problem solving, you instantly gain more clarity, so you can find answers more easily. You view the problem as a positive challenge and an opportunity to show off your creative skills! 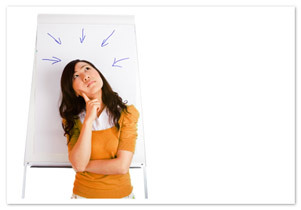 What are the benefits of Mind Maps for problem solving? Mind Maps prioritise the most important aspects of your problem, focusing your mind. The use of colours and images stimulate your brain, meaning that you are engaged and ready to solve the problem. By using radial thinking, your brain generates more ideas and associations, for many solutions. Make two separate Mind Maps, one for the problem itself, and one for the possible solutions. Make the problem the central idea of your Mind Map. Add as main branches all of the aspects and causes of the problem, investigating further detail with sub-branches. Through exploring the problem in this way, you should begin to realise why the problem occurred, and what you can do to improve the situation. Make ‘Solutions’ your central idea. Add all of the routes through which you could solve the problem as main branches – include any colleagues, organisations, techniques or resources which could help – making sub-branches to explore the details of these further. By using a Mind Map for problem solving, you will realise that one obstacle could potentially have many solutions. You should be able to see which option is most cost-effective/practical/time-saving. Make a final branch with the most suitable solution or combination of solutions for this particular problem, then make sub-branches of the details and how you plan to implement this. Taking a walk – the Romans believed in a principle called ‘solve it as you walk’, as you remove yourself physically from the problem, take in fresh air and become creatively inspired. Breathing steadily – research has proven that controlling your breathing can reduce your heart rate and improve the flow of oxygen around your body. Daydreaming! Take your mind off the problem briefly and engage your mind in a focused daydream. This will instantly make you feel calmer, more positive and creative. How can iMindMap help with problem solving? iMindMap is a great way to collate all of your information about the problem, and any resources that could form a solution. For example, you can drag and drop any files into your Mind Maps – perhaps a budget spreadsheet, a video, or Word document – taking the ‘Big Picture’ aspect of Mind Mapping to a whole new level. With a range of information at your fingertips, all in one Mind Map, you feel more ready for problem solving and in control than ever before. 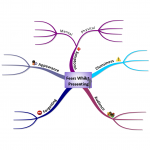 iMindMap also includes focus applications, such as Focus In and Out and Expand and Collapse Branches which can help to navigate around your problem and focus your mind. In this article, you will have discovered how Mind Mapping can calm you down, focus your mind and generate limitless solutions when problem solving. Next time you’re faced with a problem, don’t get stressed – get Mind Mapping!